A Christmas stamp which many Hindus said was "disrespectful" to their religion has been partially withdrawn. The Royal Mail has agreed not to replace the 68p stamp, which depicts a Hindu couple worshipping the baby Jesus, when current stocks run out. And the stamp, one of six depicting images of Madonna and child, will be given only to those who ask for it. The Hindu Forum said it was pleased "to a certain degree", but the stamp's sale should have been stopped completely. The group's secretary general Ramesh Kallidai said: "At least they have made some changes in the way the stamp is being sold, but of course we would have been more pleased if they had stopped the sale in its entirety." The forum, an umbrella group for 250 Hindu organisations, had said the stamp was the equivalent of having a vicar in a dog collar kneeling down to the Hindu deity Lord Ram on a festival stamp. A Royal Mail spokesman apologised for any offence caused. "We apply a rigorous research process to all our stamp development and in this instance we sought and acted on the advice we were given. "With hindsight we now recognise that we should have consulted further and we are currently reviewing processes to improve and reinforce them." The move represents something of a climbdown as the Royal Mail refused to withdraw the stamp amid protests last week. The image on the stamp, taken from a 17th Century painting, features a man with a "tilak" marking on his forehead, identifying him as a Vaishnava Hindu. The woman in the picture has the traditional "kumkum" mark on her forehead identifying her as a married Hindu woman. The original painting hangs in a gallery in Mumbai (Bombay) in India. A Royal Mail spokesman last week said it had been common for artists to paint images that depicted Western culture, including paintings about Christianity. 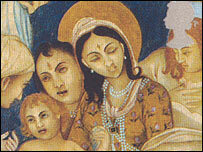 He said: "The stamp simply features a Hindu artist's interpretation of Christianity's Madonna and Child scene. "However the Royal Mail does apologise for any unintentional offence caused to the Hindu community."